A spinning copper disc is slowed down when a magnet is brought near it. Note that copper is not a magnetic material. Eddy currents are induced in the disc due to the relative motion of the disc and the magnet. The magnetic fields associated with these currents have such a direction that they oppose the cause that created them in the first place (Lenz rule). As a result they oppose the relative motion between the disc and the magnet and hence the disc is slowed down. This episode is an introduction to electromagnetic induction. The presentation is supported by many experimental demonstrations. The video covers the following topics: 1. Oersted’s discovery of the magnetic effect of an electric current (sometimes called the “motor effect” as it is the principle behind simple DC motors); 2. Faraday’s discovery of electromagnetic induction; 3. Magnetic flux; 4. Flux linkage; 5. Faraday’s law of electromagnetic induction; 6. Lenz’s law (or Lenz’s rule); 7. Eddy currents and their braking effect. The current drawn by a simple motor may vary in time depending on what the motor does at any given instant. 1. When a motor is connected to a battery, the current in the coil (or armature) increases dramatically but as soon as the coil starts rotating increasingly faster, the current drops and settles at a certain value. This is because of the so-called "back emf" induced in the coil as it rotates in a magnetic field (Faraday's law). The back emf has such polarity that it opposes the emf of the cell (Lenz's law). 3. When the motor does work on an external load and it slows down, the back emf drops as its value depends on how fast the armature spins. As a result, the current through the motor increases up to a value that depends on how "hard" the motor works. Topics covered in this episode: (a) The period of a gravitational pendulum (b) Using a gravitational pendulum to determine the acceleration due to gravity, g, (c) Measuring mass using harmonic oscillators, (d) Energy in SHM, (e) Connection between SHM and uniform circular motion. This video shows a simple circuit consisting of a light bulb and a variable resistor (rheostat). The voltmeter measures the voltage across the terminals of the battery: V = emf - Ir, where emf is the electromotive force of the battery, I is the electric current in the circuit and r is the internal resistance of the battery. When the switch is open, I = 0 and V = emf. When the switch is closed, a current flows through the circuit and V = emf - Ir. V can also be calculated as IR where R is the total resistance of the circuit. If R is increased, I decreases and V increases (as the product Ir gets smaller and V = emf - Ir). This video shows a couple of torches/flashlights that use electromagnetic induction to function. They do not need batteries. The second part of this video shows a simple handheld electric generator which is one of the most common applications of electromagnetic induction. The video also shows that the electric generator is nothing else than an electric motor used in reverse (i.e. instead of putting a current through a coil placed in a magnetic field in order to obtain motion, we turn the coil in a magnetic field in order to generate an induced current). When a magnet is moved in or out of a coil, a current is induced in the coil. The size of the induced current depends on how fast the magnet is moved. The direction of the induced current depends on the polarity of the magnet and on the direction in which the magnet moves (i.e. towards the coil or away from the coil). The size of the induced emf (voltage) across the two ends of the coil can be determined from Faraday’s law. The “polarity” of the induced emf can be determined from Lenz’s law. A current-carrying conductor placed in a magnetic field experiences a force. The direction of this force depends on the direction of the magnetic field and the direction of the electric current. If the conductor is perpendicular to the magnetic field lines, the size of the force can be calculated using the formula F = B x I x L where B is the magnetic field strength, I is the electric current and L is the length of the conductor in the magnetic field. This effect is sometimes called the “motor effect” as it is the basic principle behind an electric motor. When a current passes through a conductor or a coil, a magnetic field is created in the surrounding space. Its presence can be revealed by using a compass needle. Changing the direction of the current changes the polarity of magnetic field produced. This video is an introduction to simple harmonic motion (SHM). SHM is a type of periodic motion for which the force that drives it is proportional to the displacement from the equilibrium position. What is the equation that describes this type of motion? The answer and more in this episode. This first part covers the basics of SHM. The second part (a separate video, Episode #8) covers, amongst other things, some practical applications of SHM. The video is also available on my Vimeo, Blip.tv and Youtube channels. What is the purpose of plotting various graphs for moving bodies? How are quantities like displacement, velocity and acceleration calculated from graphs of motion? This podcast covers the three main types of graphs: displacement-time, velocity-time and acceleration-time graphs. What is IB Physics? Are you a student who is just about to start the course? This presentation is a 10-minute overview of the IB Physics course. The topic of this episode is Uniform Motion. What is an equation of motion? How does the equation of motion look like in the specific case of uniform motion? How do we use equations of motion in solving problems? The answers, with examples, in this episode. You can also watch this episode on my blip.tv page and my youtube channel. Uniform motion, uniformly accelerated motion, uniform circular motion, simple harmonic motion - what is the difference between all these types of motion? This episode covers the most common types of motion one may come across while studying physics in high school. This episode is also available on my youtube channel and on my page at blip.tv. If you want to describe the motion of a moving body, you have at hand three important physical quantities: speed, velocity and acceleration. How is each one of them defined? What's the difference between average and instantaneous velocity? The answers and more in this third episode. This episode is also available at blip.tv and on my Youtube channel. The topics covered in this second episode are: displacement, vector addition, vector subtraction, products of vectors, components of a vector. The topic of this first podcast is Physical Quantities. Scalars and Vectors. Welcome to IB Physics Help Podcast! My name is Horatiu Pop. I'm a teacher and this is my podcast about physics. I'm currently teaching physics in a school in Warsaw, Poland. IB Physics Help video podcast is designed to provide my students with an alternative revision resource. In our school we follow the IB curriculum. However, I hope that anyone studying physics in secondary school will find this podcast useful. Disclaimer: This podcast is not associated with or endorsed by the International Baccalaureate. UPDATE (August 2011): I am no longer working in Poland. I'm now teaching physics at an international school in Hamburg, Germany. 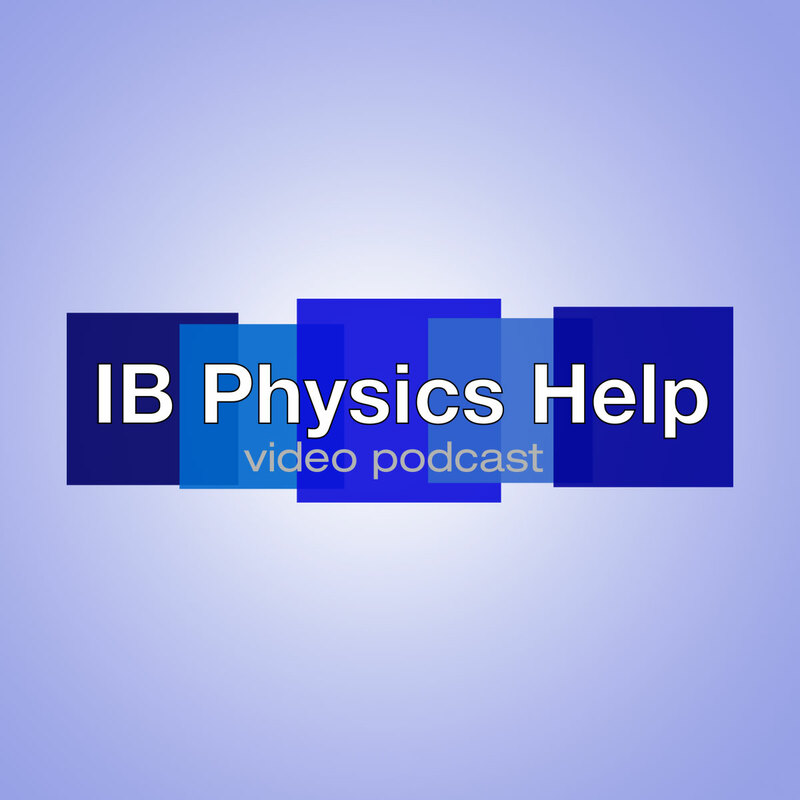 Share: Welcome to IB Physics Help Podcast!